This is a pad of 25 Record Blanks for the Model 32020 Purdue Pegboard Test. 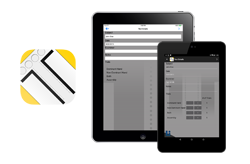 Lafayette Instrument is proud to unveil the Purdue Pegboard Scoring Application for Android™ and iOS. This tablet-based app is intended for use with the Lafayette Instrument Company Purdue Pegboard Test (Models 32020 and 32020A), and it assists administrators in all areas of the testing process by standardizing administration through easily set up test batteries with optionally read instructions, creating organizational norms, and keeping track of individualized data. Visit Google Play or the iOS App Store today to download the free 12 test trial. Bulk in-app purchases are required for continued usage. This scoring application is intended for use with the Lafayette Instrument Company Purdue Pegboard Test (Models 32020 and 32020A); It assists administrators in all areas of the testing process by standardizing administration through easily set up test batteries with optionally read instructions, creating organizational norms, and keeping track of individualized data.